As more companies continue their quest to become world-class organizations and gain a competitive advantage in the marketplace, Procurement and Strategic Sourcing teams will be called upon to deliver more value than simply cost savings. In the latest free Whitepaper, 5 Pro Tips for Impactful Procurement, Source One dissects the most common challenges Procurement groups face on the road to best-in-class, and provides executable solutions for overcoming the one-size-fits-all approach to better align with enterprise-wide goals. 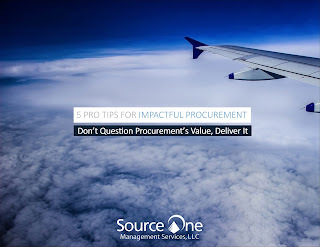 Source One’s VP of Professional Services recounts how many clients turn to Source One as a Procurement services provider to help them identify and implement ways to optimize their tools, technology, metrics, processes, and people, both internally and externally. The whitepaper mirrors this ideology that with the right approach, Procurement organizations can deliver significant value, and truly become best-in-class. Source One’s free whitepaper aims to help Procurement groups become true business partners as one of the few functions that influences new innovations into the organization. With the right people, technology, and metrics, Procurement will more effectively execute on transformative initiatives that enable ongoing success. To learn more about Source One, visit our Procurement Transformation Advisory webpage. To read the whitepaper, visit http://www.sourceoneinc.com/news-research/research-and-whitepapers/research-papers-overview/.